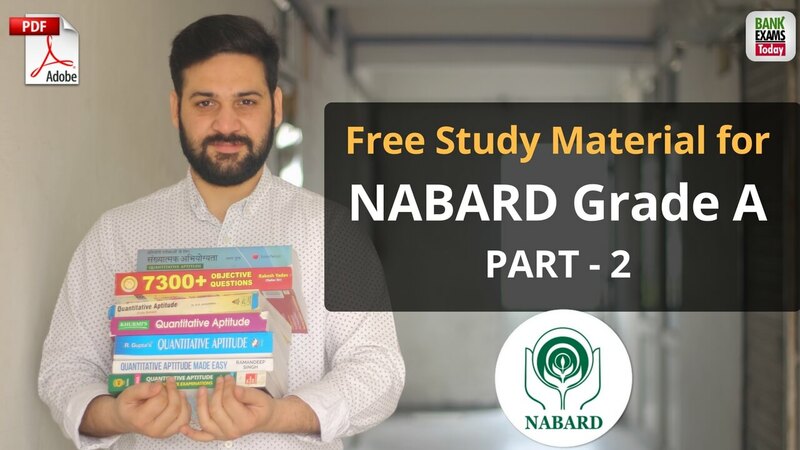 Today we are releasing the second part of NABARD Grade A study material. To continue assistance to set up small dairy farms and other parts to bring structural changes in the dairy sector. Farmers, individual entrepreneurs, NGOs, companies, groups of organised and unorganised sectors. Groups of the organised sector which includes Self-help Groups (SHGs), dairy cooperative societies, milk unions, milk federations, and all that. An individual will be qualified to avail assistance for all the components under the scheme but only once for each component. More than one member of a family can be supported under the scheme granted; they set up separate units with separate infrastructure at different locations. The extent between the boundaries of two such farms should be at least 500 metres. Launched by: The Department of Agriculture & Cooperation through National Centre of Organic Farming (NCOF) in collaboration with NABARD or National Cooperative Development Corporation (NCDC). To support and develop organic farming in the nation by advancing accessible organic inputs like bio fertilisers, bio pesticides and fruit & vegetable market waste compost and how to generate a better return for the product. To boost agricultural productivity while conserving soil health and environmental protection. To lessen the total dependence on chemical fertilizers and pesticides by expanding the availability and advancing the quality of bio fertilisers, bio pesticides and composts in the farming sector. To prevent pollution and environment degeneration by proper resolution and utilization of organic trash. The scheme is being performed since 2004-05 and executed by the Department of Agriculture & Cooperation through National Centre of Organic Farming (NCOF) in collaboration with NABARD or National Cooperative Development Corporation (NCDC). The increasing and random use of synthetic fertilizers and pesticides and deteriorating soil health and productivity are affecting people from all over the world. Raising awareness for safe and healthy food has emphasized the importance of organic farming, which is a holistic system based on the basic system of minimizing the use of external inputs and avoiding the use of synthetic fertilizers and pesticides. By viewing this challenge, there is a need in the country to increase the infrastructure for production of quality organic and biological inputs. Therefore, under the National Project on Organic Farming, a Capital Investment Subsidy Scheme for Commercial Production Units for organic/ biological Inputs has been started. To create scientific storage capacity with allied amenities in rural areas to suffice the requirements of farmers to store farm products, processed farm products and agricultural inputs. Promotion of grading, standardisation and quality control of agricultural products to increase marketability. To prevent distress sale directly after harvest by giving the facility of pledge financing and marketing credit. To strength agricultural marketing infrastructure in the nation by introducing national system of warehouse receipts, in respect of agricultural products stored in such godowns. Turn the declining trend of investment in the agriculture field by encouraging private and cooperative sectors to finance in storage infrastructure in the country. It is a well-known reality that small farmers of the country do not have the financial strength to maintain their farm products with them till the market prices become agreeing. To facilitate farmers to meet their credit requirement without being forced to sell their products at unfavourable prices. To accommodate extra agricultural marketing infrastructure to cope up with the large expected marketable residues of agricultural and related products which includes dairy, poultry, fishery, livestock and minor forest produce. To develop and support rival alternative agricultural marketing infrastructure by promoting private and cooperative sector investments to maintain incentives for quality. To improve productivity by increasing farmers’ income. To extend existing agricultural marketing infrastructure to improve efficiency. To support direct marketing to increase market efficiency by reducting intermediaries and handling channels. To provide infrastructure facilities to grade up, standardisation and quality certification of agricultural products to ensure a price to the farmers equal to the quality of the product. To promote grading, standardisation and quality certification system to give a major thrust for the improvement of pledge financing and marketing, credit, by introducing negotiable warehousing receipt system and promoting forward and future markets to sustain the market system and increasing farmers’ income. To support the direct integration of processing units with farmers. To create general awareness and provide education on agricultural marketing which includes grading, standardisation and quality certification. The Agricultural Marketing Infrastructure, Grading and Standardization (AMIGS) scheme has been formed to develop marketing infrastructure in the nation to provide the post-harvest requirement of production and marketable surplus of various farm products. An Expert Committee has been set up by the Ministry of Agriculture which has estimated that an investment of Rs. 11,172 crore would be needed for infrastructure development in agricultural marketing. A major portion of this investment is expected to come from the private sector for that a proper regulatory and policy environment is essential. Agri-Clinics are visualized to give expert guidance and services to farmers on various perspectives to improve the productivity of crops or animals and to increase the earnings of farmers. Agri-Business Centres are business units of agri-ventures set by trained agriculture professionals. That type of ventures includes maintenance and custom hiring of farming equipment, the sale of inputs and other services in agriculture and allied areas which includes post-harvest management and market linkages to generate income and entrepreneurship development. The scheme includes full monetary support for training and handholding, provision of loan and credit-linked back ended the composite subsidy. To enhance efforts of public extension by providing necessary extension and other services to the farmers on payment basis or freely as per business model of agripreneur, local needs and affordability of target group. To generate gainful self-employment possibilities for the jobless agricultural graduates, agricultural diploma degree holders, intermediate in agriculture and biological science graduate with Post Graduation in agriculture-related courses. Graduates in agriculture and allied subjects from the State Agriculture Universities (SAUs) or Central Agricultural Universities or Universities approved by ICAR/UGC. Degree in Agriculture and allied subjects offered by other agencies are also considered subject to the approval of Department of Agriculture & Cooperation, the State Government of India, on the recommendation of the State Government. Diploma (with at least 50% marks) or Post Graduate Diploma holders in Agriculture and allied subjects from State Agricultural Universities, State Agriculture and Allied Departments and State Department of Technical Education. Agriculture-related courses at intermediate (i.e. plus two) level, with at least 55% marks. Currently, to encourage the usage of solar energy, The Ministry of New and Renewable Energy (MNRE), Government of India has launched two capital linked subsidy schemes which are Solar Photovoltaic Water Pumping systems and MNRE Lighting Scheme 2016. Both these schemes are operated by NABARD. MNRE, Government of India has launched this new scheme to encourage and support 30000 solar pumping units per year with updated parameters which are valid from 3 November 2014. The main aim of the scheme is to displace diesel pump sets with solar pump sets to decrease dependence on grid power. The solar pump sets are eco-friendly and offer enormous benefits to farmers. It involves very low operating cost and gives uninterrupted power supply to farmers which enable an increase in agriculture production and income. Subsidy under this scheme is open only for solar systems which are procured from empanelled manufacturers or entrepreneurs by MNRE, Government of India for solar water pumping programme. A merger of: Grameen Bhandaran Yojana (GBY) and the Scheme for Development/Strengthening of Agricultural Marketing Infrastructure, Grading and Standardization (AMIGS). To encourage agriculture marketing infrastructure projects for lessening the involvement of middlemen and reducing post-harvest losses. To assure better payment to farmers and supply of better quality products to customers and processing enterprises. To produce a robust agricultural marketing infrastructure for effective management of marketing surplus in agriculture, horticulture and allied sectors like dairy, poultry, fishery, livestock, and minor forest produce. To support innovative and latest technologies in agricultural marketing infrastructure. To promote competitive alternative agricultural marketing infrastructure by boosting investments from private and cooperative sectors. To improve direct marketing to build market efficiency with an aim of intensifying farmers’ income by a reduction in intermediaries and handling channels. To foster the creation of scientific storage capacity for storing farm products, processed farm products, and agricultural inputs, etc. to lessen post-harvest and handling losses. To accommodate infrastructure facilities for grading, standardization and quality certification of agricultural products. To support Integrated Value Chains to facilitate the vertical integration of farmers with primary processors. To build general awareness and give training on various aspects of agriculture marketing like grading, standardization and quality certification. The sustainable development of the livestock sector. NABARD is the subsidy channelizing agency which works under Entrepreneurship Development & Employment Generation (EDGE) component of National Livestock Mission which includes Poultry Venture Capital Fund (PVCF), Integrated Development of Small Ruminants and Rabbit (IDSRR), Pig Development (PD), Salvaging and Rearing of Male Buffalo Calves (SRMBC). To grant loans to sugar mills for the clearance of cane price arrears of earlier sugar seasons and timely settlement of cane price of present sugar season relating to Fair and Remunerative Price (FRP). The loan will be approved to the sugar mills which have been working during the financial year 2013-14 sugar season and loan would be to the area of last three sugar seasons' excise duty, cess and tax on sugar. The loan is to be sanctioned for a period of 5 years which includes 2 years as a moratorium period. The government of India gives interest subvention up to a maximum of 12 % or actual rate which one is lower. Loans sanctioned by 30 June 2014 and disbursed by 30 September 2014 by the lending banks would be qualified for interest subvention facility. State Bank of India (SBI) has been appointed as “Nodal Bank” for interacting with Department of Food and Public Distribution and managing the subsidy funded for onward reimbursement to respective banks. NABARD would coordinate on behalf of Cooperative Banks and Regional Rural Banks (RRBs) and would submit requests to SBI for payment. To grant loans to sugar mills for the clearance of cane price arrears of earlier sugar seasons and timely settlement of cane price of present sugar season relating to Fair and Remunerative Price (FRP) of sugarcane to the sugarcane farmers. The quantum of a loan would be equivalent to 11% of their reported production of white sugar in sugar season 2013-14 as certified by Central Excise authorities involved. There will be an interim of one year on repayment of the loan. Loans sanctioned and disbursed by 30th September 2015 by lending banks, pursuant to Gazette notification, would be qualified for interest subvention facility. Interest subvention up to 10% at the simple interest or the real rate charged by the banks, which one is lower, shall be granted to the sugar mills for the greatest period of one year by Government of India. Interest subvention will be released on a periodical basis by the nodal bank which is State Bank of India. To ensure that farmers receive short-term credit at 7 %, with an upper limit of Rs. 3.00 lakh on the principal amount. The amount of subsidy was to be calculated on the amount of crop loan from the date of payment up to the date of repayment. In pursuance of this notice, the Government of India has granted interest subsidy of 2 % to Public Sector Banks, Regional Rural Banks (RRBs) and Cooperative Banks with respect of short-term production credit up to Rs. 3.00 lakh provided to farmers out of their own resources, granted that they make available short-term credit at the rate of 7 percent per annum at ground level. The scheme has continued in the following years with certain adjustments and changes in the rate of subvention which are as under. Since the financial year 2009-10, the government of India has proposed an additional incentive for farmers who repay the loans quickly on or before the due date or the date fixed by the lending bank, subject to a maximum period of one year. To grant relief to farmers affected by natural calamities, Interest Subvention of 2% has been made available to lending banks for the first year on the restructured amount of crop loans. In order to curb distress sale of products by farmers and to promote them to store their products in warehouses. Post-harvest loans against Negotiable Warehouse Receipts (NWR) provided by banks to Small and marginal farmers (SF/MF) who have Kisan Credit Cards are qualified for interest subsidy, for a period up to six months on the same rate as available to crop loan. SF/MF, who have not get crop loans by the banking system, are not eligible. No additional subvention towards timely repayment, as is available for crop loans, is visualized under the scheme. Interest subsidy is available to NABARD to provide concessional refinance to RRBs and Cooperative Banks. NABARD is reversed to the extent of the difference between the weighted average costs of funds assembled and refinance rate. Further, the administrative cost of 20 basis points is also granted by the government of India. It aims to facilitate technology up-gradation of Small Scale Industry units in the specified products or sub-sectors by introducing well-established and upgraded technologies approved under the scheme. NABARD is designated as one of the nodal agencies to channelize grant under the scheme through Cooperative Banks and RRBs and Commercial banks. To promote poverty reduction by building robust institutions of the poor, especially women, and empowering these institutions to reach a range of financial services and livelihoods services. NABARD is implementing the Interest Subvention Scheme for Women SHGs under DAY-NRLM for RRBs and Cooperative Banks in Category-I (250) districts. Out of the above schemes, the following two schemes are being performed by NABARD. The RRR package was aimed to cover all viable and potentially viable apex and primary weaver cooperative societies (PWCs). The quantum of compensation for weaver societies and individual weaver was based on audits and direction of state implementation, monitoring and review committee. As per the guidelines of RRR package, all viable and possibly viable Apex and Primary weaver societies (as per the package norms) were to be covered under the package. The quantum of assistance to be made available to each weaver society is linked to special audit on the basis of the audited Financial Statements (Balance sheet & P/L Account). To accommodate subsidized loan to handloom sector at the interest rate of 6 percent per annum for a period of three years, the quantum of interest subsidy to be supported by the Government of India is for three years and limited to the difference between the actual rate of interest which is applicable and charged by the Banks and 6% to be borne by the borrower. Though, the Government of India interest subvention is capped at 7 percent. Margin money assistance to a maximum of Rs. 10,000 per weaver is given, which facilitates the handloom weavers, Self-Help Groups (SHGs) and Joint Liability Groups (JLGs) to use this amount for borrowing loans from the lending banks. Nevertheless, weavers’ cooperative societies, weavers’ producer companies, etc. are not qualified for the margin money assistance. If in case, the requirement of margin money for the loan required by the weaver is more, then the beneficiary or State Government or Implementing Agency or in any combination thereof will be expected to give a supplementary amount of margin money.